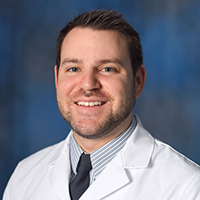 Dr. Andrew Whitman, a clinical pharmacist in oncology and palliative care at the University of Virginia Health System, and four colleagues from UVA Health System and the University of Rochester Medical Center, conducted a pilot study to address a gap in evidence-based standardized medication assessment for older cancer patients. He completed a combined Doctor of Pharmacy degree and Certificate of Aging Studies at Virginia Commonwealth University School of Pharmacy, and his postgraduate training at the UVA Health System in oncology pharmacy followed by a year as a palliative care specialist at the University of Maryland Baltimore-Washington Medical Center. His main research interests include de-prescribing in older cancer patients and innovative approaches to supportive care. What spurred your interest in a pilot study of polypharmacy in older adults with cancer? I have always had a strong interest in working with older adults. I had the unique opportunity to study pharmacy and gerontology as a combined degree program during pharmacy school. While completing my PGY2 oncology pharmacy residency I wanted to merge my oncology and geriatric interests. There was an existing geriatric oncology program at the cancer center where I practiced at which we completed comprehensive geriatric assessments; our team consisted of a medical oncologist, nurse, physical therapist, and pharmacist. My primary role, as the pharmacist, was to provide detailed medication reviews of each patient. I found a paucity of data in the literature supporting standardized medication assessments in older cancer patients. This literature gap was the main spark in putting together this pilot study. How did the Choosing Wisely campaign intersect with your research aims for this project? A large part of our pilot study was focused on aligning patient goals of care to appropriate medication use. Also, efforts to minimize polypharmacy and potentially inappropriate medication use were aimed at improving quality of life, reducing pill burden, improving adherence to essential therapies, and decreasing the incidence of adverse effects. Our goal was to avoid unnecessary therapies while promoting communication between patients, caregivers, and their providers. I found this consistent with Choosing Wisely’s motto “promoting conversations between patients and clinicians.” Likewise, we attempted to make each of our deprescribing recommendations evidence based and to continue patients on medications that were truly necessary – these are all consistent with Choosing Wisely’s mission statement. Why did the sequential three-tool assessment of medication usage have the best results? Each of the medication screening tools have unique differences and when you use them together we are able to obtain a more in depth review. The Beers Criteria and STOPP are both explicit screening tools that review specific medications or medication classes – these tools help to flag high risk medications quickly. The medication appropriateness index, or MAI, is an implicit tool that allows the clinician to evaluate medications not flagged by the Beers Criteria or STOPP. The MAI looks at very practical aspects of care such as medication cost, if the indication is appropriate, if it is effective for intended condition, etc. The MAI helps align patient goals to appropriate medication changes. What do you foresee as the long-term impact of your study results on overuse in pharmacy? I believe that this study has set the stage for impactful deprescribing interventions in older cancer patients. The study has shown the feasibility of pharmacy involvement in the clinic setting and it is encouraging that additional research in this area is ongoing. Our hope is that it highlights the severity of polypharmacy in this population and that clinicians start to understand its significance in health care a whole. Do pharmacists have a particular role to play in addressing overuse in health care? One of the biggest roles pharmacists can play in reducing overuse in health care is empowering patients to ask the right questions (i.e., is this medication necessary? When should we reassess the need for this medication? Should I or will I be on this medication forever?). In addition, I think pharmacists can make a large impact in transitions of care. Medication induced hospital admissions and re-admissions are common and having pharmacists involved in polypharmacy review, deprescribing, and medication education is essential to avoiding overuse in health care. What other areas of pharmacy research do you feel are ripe for research in high-value care? Patient falls impart a significant burden on our health care system. Additional studies are needed that evaluate deprescribing interventions, the impact on patient falls, and associated financial burden.